Freezenet Podcast Episode 05 for March 2019 Now On Patreon! The fifth episode of the Freezenet official podcast for March of 2019, “#RIPInternet” is now on Patreon. Freezenet Podcast Episode 04 for February 2019 Now On Patreon! The fourth episode of the Freezenet official podcast for February of 2019, “#SaveYourInternet” is now on Patreon. 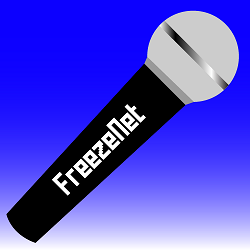 In this third episode of the Freezenet official podcast, we take a look at the news and reviews for the month of January. Freezenet Podcast Episode 03 for January 2019 Now On Patreon! The official Freezenet podcast for January 2019, “Gone in 60 Milliseconds”, is now available on Patreon. It’s our third episode. In our second episode of the Freezenet official podcast, we offer you our year end special! All this along with the top stories and more. Freezenet Podcast for December 2018 Now On Patreon! The year end special for Freezenet’s official podcast (December 2018) is now on Patreon for those who want early access. It’s the beginning of something new! This is the first episode of the official Freezenet podcast for November 2018.